The goal of this research topic is to study the interaction between heavy ions and thin films with giant magnetocaloric effect (GMCE) and long-term induced modifications on these samples. GMCE is related to a large variation in entropy associated to a first-order phase transition. 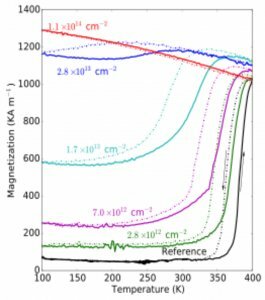 Thanks to this large variation in entropy when an external magnetic field is applied, GMCE materials are very interesting for their use in magnetic refrigeration, a new alternative method, more efficient and more environmentally friendly than the commonly used refrigeration methods (see Fig. 1). However, applications are currently limited by two factors : 1) the presence of hysteresis phenomena related to the first-order phase transition, and 2) the difficulty of tuning in a controlled manner the temperature at which the magnetocaloric effect is maximal. Left : Comparison between a magnetic refrigeration thermal cycle (Brayton cycle) and the gas compression / expansion cycle commonly used. Right : The same cycle represented on the entropy-temperature diagram. In recent years, we discovered a method to solve these two obstacles based on heavy ion irradiation of these materials. 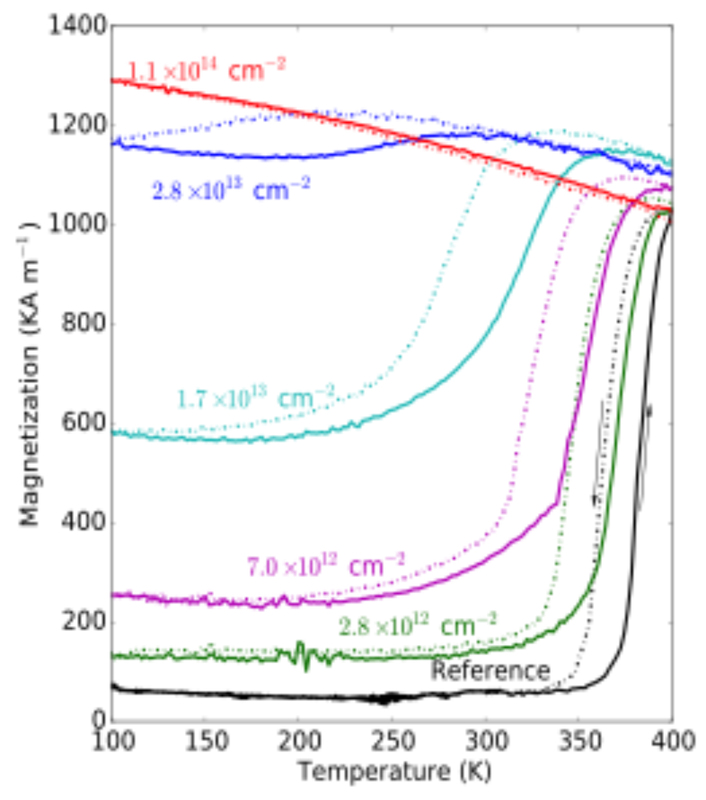 We have been able to demonstrate that it is possible to reduce and even completely and permanently eliminate the hysteresis while preserving the giant magnetocaloric properties of thin films of manganese arsenide (MnAs, Fig. 2). In iron-rhodium films, we have also demonstrated that the transition temperature associated with the GMCE can be modulated simply by adjusting the incident ion fluence on the sample (Fig. 2). By changing the kinetic energy of the ions, other studies are underway to provide precise information on the defects induced by the ion collisions on the samples. Other types of GMCE materials are also being investigated. Left : suppression of the thermal hysteresis by irradiation of ions in thin layers of MnAs (applied fields of 1 T). Right : Peak of the magnetic entropy corresponding to the application of a 2 T magnetic field on irradiated and reference samples. Shift of the transition temperature by irradiation of ions in thin layers of FeRh at different fluences. This topic is developed in collaboration with the ELACOU team (M. Marangolo) of the INSP, the Satie laboratory (M. Lo Bue) and the CNRS / Thales laboratory (V. Garcia). From October 2018, this research will be developed within the ANR HyPerTherMag project.